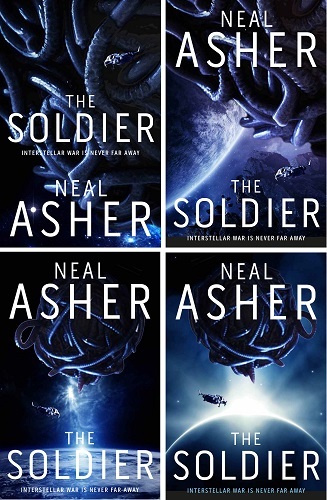 Read the story behind the cover of Neal Asher's latest novel, The Soldier. Read the story behind the cover of Neal Asher's latest novel. The Soldier, which publishes in May 2018 is set in Asher's popular Polity universe - in a far-flung region of space, where a watcher guards some lethal ancient technology. . . If you're new to the Polity, we have a handy introduction here. The Soldier is the first book in a brand new trilogy: The Rise of the Jain. And you can check out a free extract of Dark Intelligence, book one in the Transformations Trilogy, here. We always present new covers as beautiful finished products - but they are actually the end result of a long process of collaboration between the Pan Macmillan Art Department, the author, the editor, the Comms and Sales teams, and sometimes a freelance artist. In this case, after receiving the brief from the editor, Pan Macmillan designer Neil Lang and illustrator Steve Stone began that process with a picture of worms. A writhing mass of worms on the pavement. Not the most appealing image for a cover design, you might think. But, believe it or not, this is what provided the inspiration for the design of the 'wormship' which features heavily in The Soldier. From these humble origins, Neil and Steve created a whole spaceship design, and experimented with some different cover compositions which fitted the brief provided by editor, Bella Pagan. And from THERE, we are proud to present (drumroll) the finished cover! Unlike the majestic but slightly static early drafts, this image crackles with energy and potential. Beautiful and faintly ominous, this is definitely a cover you want to take a closer look at. And to think it all began with a pile of worms . . . ! Meanwhile, humanity’s galactic territories and the alien Prador Empire watch this sector of space with interest, as neither can allow the other to claim its power. However, things are about to change. The Jain might not be as dead as they seem and interstellar war is never far away . . . The Soldier, the new novel is Neal Asher is published on 17th May 2018.